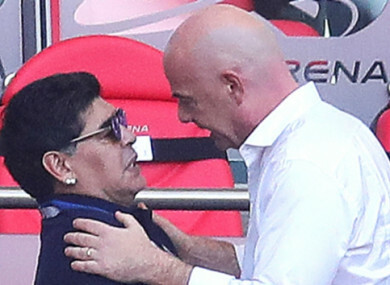 Political football: Diego Maradona and FIFA chief Gianni Infantino. DIEGO MARADONA HAS apologised to Fifa over his criticism of referee Mark Geiger following England’s World Cup penalty shoot-out win over Colombia in the round of 16 on Tuesday. The Argentina icon – who has rarely been out of the headlines during Russia 2018 – claimed Colombia were victims of a “monumental theft” and laid into the performance of the officials. England had been awarded a second-half penalty for a foul by Carlos Sanchez on Harry Kane – a decision that drew the particular ire of Maradona. Fifa responded and described the 57-year-old’s comments as “entirely inappropriate and completely unfounded”. But Maradona has now moved to make peace with world football’s governing body by stressing that he simply got carried away in the moment. “Taken by the thrill of cheering for Colombia the other day, I said a few things and, I admit, some of them are unacceptable,” he wrote on Instagram. “My apologies to Fifa and its president. Email “Maradona apologises to Fifa over England 'monumental theft' claim”. Feedback on “Maradona apologises to Fifa over England 'monumental theft' claim”.